NÄƒm nay, Chill Dining tiáº¿p tá»¥c vinh háº¡nh tá»• chá»©c má»™t Ä‘Ãªm áº©m thá»±c MICHELIN “Four Hands Dinner” – sá»± káº¿t há»£p má»›i máº» vÃ Ä‘á»™c Ä‘Ã¡o giá»¯a Báº¿p TrÆ°á»Ÿng Michelin Jason Tan Ä‘áº¿n tá»« nhÃ hÃ ng CORNER HOUSE – Singapore Botanic Gardens vÃ Báº¿p TrÆ°á»Ÿng Chill Dining – Dannet D’Souza. ðŸ¥‚ Thá»±c Ä‘Æ¡n gá»“m CanapÃ©s vÃ 5 mÃ³n chÃ­nh dÃ¹ng kÃ¨m Trá»©ng CÃ¡ vá»›i giÃ¡ VND 3,900,000++ (Ä‘Ã£ gá»“m rÆ°á»£u vÃ champagne), má»—i thá»±c khÃ¡ch sáº½ cÃ³ cÆ¡ há»™i tráº£i nghiá»‡m Ä‘Ãªm tiá»‡c hoÃ nh trÃ¡ng vá»›i nhiá»�u hoáº¡t Ä‘á»™ng Ä‘áº·c sáº¯c. ðŸ”› Sau tiá»‡c tá»‘i, sá»± kiá»‡n sáº½ Ä‘Æ°á»£c tiáº¿p ná»‘i bá»Ÿi “After Party” táº¡i @Chill Skybar vá»›i nhá»¯ng báº£n tÃ¬nh ca PhÃ¡p lÃ£ng máº¡n vÃ say Ä‘áº¯m cá»§a ná»¯ ca sÄ© cÃ¡ tÃ­nh Ä�á»“ng Lan. ðŸ’¢ Sá»� LÆ¯á»¢NG GIá»šI Háº N ðŸ’¢Â HÃ£y gá»�i ngay HOTLINE: 093 882 28 38 Ä‘á»ƒ Ä‘Æ°á»£c tÆ° váº¥n & Ä‘áº·t chá»— nhanh nháº¥t táº¡i Chill Dining! Excellent quality, unique taste, and impressive presentation are the reasons why the whole world admires and cannot resist trying all stand-out Michelin dishes. 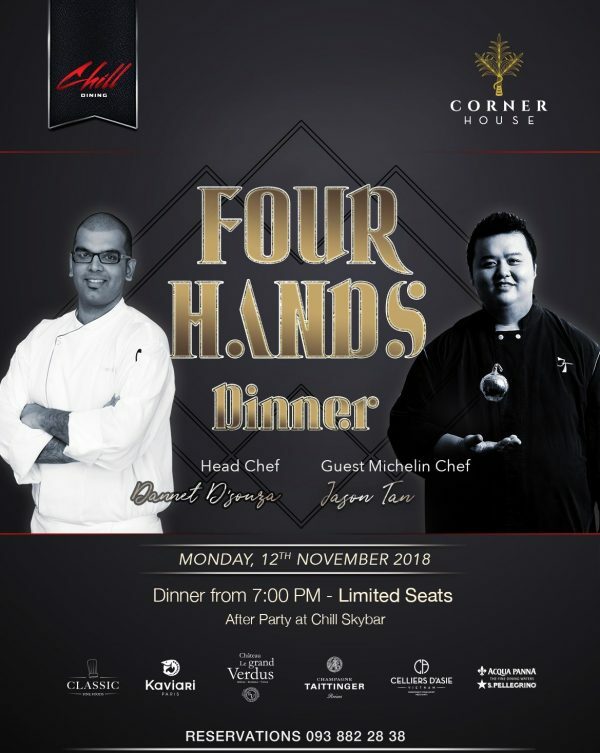 This November, Chill Dining honorably brings to our loved diners the “Four Hands Dinner” which is a Michelin experience with a collaboration of Chef Jason Tan – the one & only Singaporean MICHELIN CHEF – from CORNER HOUSE – Singapore Botanic Gardens and Chill Dining Executive Chef Dannet D’Souza. Come to this culinary arts night, you’ll not only experience the Michelin haute cuisine, but also take a journey of emotions and beautiful moments with many activities. On this occasion, Chill is immensely proud to present our first and exclusive âœ¨ CHILL PRIVATE LABEL âœ¨ caviar â€“ wines â€“ champagne. In the precious presence of Mr. Nicolas Delion – Export Director the Asia Pacific of Champagne Taittinger; Mr. Thomas the Grix de la Salle – Wine Maker / Co-Owner ChÃ¢teau Le Grand Verdus and Mr. David Macouin – Export Sales Director of Kaviari Caviar. ðŸ¥‚ CanapÃ©s and 5-course menu: VND 3,900,000++ per customer (pairing with Caviars, Wines & Champagne). ðŸ’¢ LIMITED SEATS ðŸ’¢ PLEASE BOOK IN ADVANCE! Dinner continues with an After Party at Chill Skybar, we will have another great time to indulge in the French love songs by the beautiful voice of Guest Singer – Ä�á»“ng Lan. The cuisine, the wines, the champagnes, and the music will resonate with all food & beverages and party lovers more than any other.